I doubt there’s a European fishing community that doesn’t have its own version of fishermen’s stew. The Italians call it brodetto, the French bouillabaisse, and the Portuguese refer to it as caldeirada. Even in the this country, San Francisco is well-known for its cioppino — the real “San Fransisco treat,” in my book. Although some of the ingredients may vary by country and region within each country, the dish’s origins are often the same. The village fishermen would gather together at the end of a very long day and into a large pot they would add whatever fish that hadn’t been sold, a few vegetables, some spices, and a little wine. A short while later, with some crusty bread in hand, each would sit back and enjoy a feast among friends, no doubt filling the night air with tales of the ones that got away. 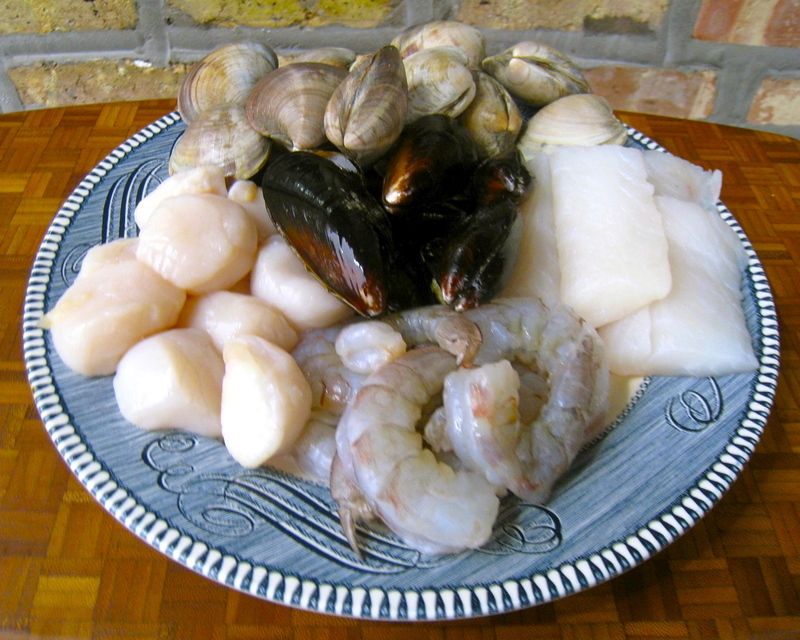 Living in Chicago, we have a wide assortment of seafood available, some of which is fresh while the rest has been flash frozen for shipment here. Although I prefer fresh, I will buy frozen and usually have shrimp and a variety of fish fillets in my freezer. If I see a sale somewhere for fresh mollusks, be they little neck or manila clams, mussels, or cockles, I’ll buy some, along with some scallops, and that night’s dinner will be brodetto. The recipe I’ll follow then is the one that I’m going to share with you now. And just like the stew the old fishermen threw together, the amount and types of seafood in my brodetto may vary but the basics remain the same. Fish, mollusks, and shrimp are added to a simple tomato broth flavored with a few herbs, garlic, and wine. Serve it in a bowl with some crusty bread, like ciabatta, and you’ll have a spectacular dinner, as well as a new-found respect for those fishermen of old. At least an hour before you start cooking, scrub all the mollusks with a brush and soak the clams and cockles in cold water. Change the water at least once in the next hour. If using mussels, before scrubbing, grab hold of the “beard” and pull to remove. Keep cold until ready to cook. Once the mollusks have been sufficiently soaked and cleaned, heat olive oil in a large saucepan over med-high heat. Add red pepper flakes and cook for 1 minute. Add onion and sauté until translucent, about 5 minutes. Season lightly with salt and pepper. Add garlic and parsley and continue sautéing for another minute or so. Add stock and wine, using the liquids to deglaze the pan. Add the tomatoes. If using canned whole tomatoes, use your hands to tear the tomatoes before placing the chunks into the pan. This is a stew, not a sauce. Large chunks are preferable. Add thyme and Italian seasoning. Season lightly with salt & pepper. Bring pot to the boil, reduce heat to med-low, and simmer for 30 to 40 minutes. If stew becomes too dry, add water or stock. Increase heat to med-high, add clams and/or cockles and cover the pan. After about 3 minutes, add the mussels and cover. About 3 minutes later, place the shrimp atop the mollusks and return the cover to the pan. 2 minutes later, add the scallops and cover the pan. About a minute later, add the fish to the top of the stew, cover the pan, and cook until all is done, about 3 or 4 minutes. Serve immediately in large bowls, garnished with a sprinkling of good quality extra virgin olive oil and freshly chopped basil. Be sure to have plenty of good, crusty bread available. The recipe I’ve just shared is by no means set in stone. I imagine that the fishermen of long ago weren’t too strict about their ingredients. I think their only concerns were that the seafood was fresh and the wine plentiful. The rest took care of itself. Today, recipes abound and it’s not just the seafood that varies from one recipe to the next. Oftentimes vegetables will be added to the stew, with bell peppers, fennel, and potatoes frequently mentioned. Some cooks will start the recipe by creating and sautéing a soffritto of chopped onion, celery, and carrot. What does all this mean for you? Well, do you have a preference for, say, crab claws? Then add them to the mix. Don’t like mussels? Don’t use them. Want more of a vegetable base for your stew? Then start with a soffritto and add whatever veggies you like. In short, indulge your palate and make the recipe your own. This entry was posted in Main Course (Secondi), Pasta/Rice/Soups (Primi Piatti), Seafood (Frutti di Mare), Vegetarian and tagged Cooking, Food, Italian, Recipes, Seafood, Stew by ChgoJohn. Bookmark the permalink. Such a great dish! I love the post in general. You’re a snappy writer, or should I say snapper? Oh gosh, that was bad. That last plate brimming with seafood, oh my! I love this recipe or shall I say method as you’ve provided a great foundation for putting together a heavenly dish! As you wrote, variations are all personal preference and availability. I’ve not made “cioppino” (as I refer to it) in a long time but after reading this, I’m excited to make it real soon! 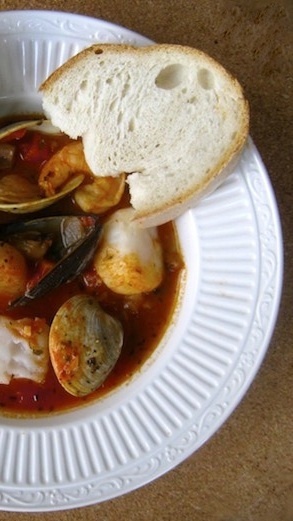 As good a cook as you are, and with the seafood available to you living in Florida, I bet you make a wicked cioppino. I have to comment first on your blog as a whole. It is a wonderful tribute to your family. Preserving family memories and recipes for yourself, your family and now followers from all over the world. Thank you for sharing. We have an abundance of fresh seafood here in New England and your recipe will highlight it. Thank you for stopping by and taking the time to leave so gracious a comment. How I envy anyone living along the Coast, with your close proximity to seafood. It’s not just the abundance but the variety that is available to you all. I’d be willing to bet that if I lived near the ocean, that I’d be known as “that pest” by all of the fish mongers in my area — but I’d be smiling come dinnertime. Please, do come back anytime. I love Cioppino! The last time I had it was when I was in New England, on our way to Cape Cod!! Your recipe is just oustanding and perfect for this summer season!! You are a lucky man living in Chicago, great city with great food!!! There was a time when I was offered a number of positions around the country but I always turned them down in favor of Chi-town. I love it here. Sure, our Winters may be a bit harsh but our Summers & Falls more than make up for them. Thanks for dropping in! What an incredible rich and hearty recipe. Great use of seafood. Thanks, Mandy. I’ve read your blog and although I’ve not yet seen your recipe for fishermen’s stew, I bet it’s a winner. Your award is well-deserved. I love the romatice notion of the stew. Simple ingredients, interfered with to a minimum. Souns an looks wonderful, I’ll be adding this into my fall rotation. Thanks for posting! Thank you, David, for stopping by and commenting, If there’s one thing Mom and her sister, “Zia”, have taught me, it’s that Italian cooking is best when it’s at its most simple. Brodetto is the perfect example. At its heart, it is just seafood cooked in a simple tomato broth and seasoned with a few herbs & spices. The seafood is the star of the dish and adding too much of anything else would only be a distraction. I look forward to reading about the brodetto you prepare this Fall. I bet it will be wonderful. Growing up in NorCal I naturally love cioppino and your are absolutely correct saying the dish is the real San Francisco treat. Unfortunately I’ve never produced a cioppino at home that I am completely satisfied with, but I am excited to try out your recipe. Thanks for sharing and great blog! No trip to San Francisco is complete until I’ve dined on cioppino at least once. As for your attempts, I think you’re being way too hard on yourself. I bet yours is a mighty tasty dish. Besides, the “taste test trials” are where all the fun is, anyway. Thanks for dropping in and taking the time to comment. You’re correct I’m too hard on myself and that “taste test trials” are where the fun is. Btw next time your in the San Fran area and are up for a drive, you might want to check out Duarte’s Tavern in Pescadero (http://www.duartestavern.com/). This place has ridiculous cioppino, soups, and unbelievable homemade pie. Cheers! I haven’t made this in years…am inspired to do so again. Do you think leaving the wine out would spoil (i.e., blandify) the flavor? Perfect – I want a bowl RIGHT NOW! Thanks, Tanya, so glad you like it. This is really a simple dish to prepare but, boy, it sure makes a great meal! Good stuff. I love fish stews, and rarely make them. In part because I usually cook for the two of us, and these sorts of dishes work better in quantity (so you can get a greater variety of seafood). I should do these for company more often. And although I now have access to great fresh fish, I still buy some frozen. For one thing, the quality is so often better than fresh, because it was flash frozen at sea. The “fresh” at your market? Heck, it’s probably several days old. Second, just having it in the freezer is such a convenience! Anyway, good post – thanks. You’re right, too, about the “fresh” fish fillets at the grocery. I, too, bought frozen for the same reason you did. Well, I used to buy frozen. Life is good when you’ve a good fishmonger! Hi John, I’ve always found ‘brodetto’ (little broth) a strange name for such a richly filled seafood soup. Your version looks like the real thing. The only thing I would do differently than you (and most Italians) is to cook the seafood for an even shorter time so all is just barely cooked.